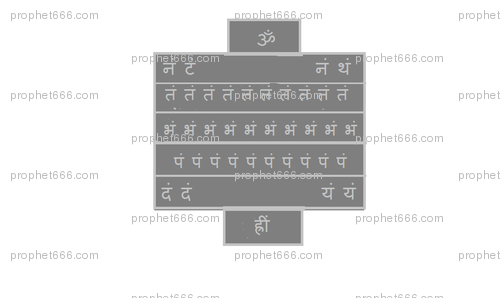 This is a Vashikaran Yantra to enchant everyone who you come across while wearing this Yantra on your body. This readers will understand is a part of the series to give information on the unique Indian Yantras; including Akarshan Yantras; I take no responsibility if someone tries these paranormal methods. After the puja the Yantra is stitched in a cloth Tabeez or inserted in a copper or silver locket and tied around the right forearm. Then whosoever sees you while you are wearing the locket will be impressed by you and become favorable towards you. Is it necessary that locket should be visible by everyone or we just need to tie? Dear Sir, some time if i want to use more than 2-3 yantra and as you have advised to put it in a taveez and wear it in your forearm, can i wear all these 3 or 4 yantra in a single thread containing 3-4 taveez. or 4 tavez should be separated by each other. plz guide. Can this yantra be inscribed on thin copper sheet and worn on hand by inserting in a silver cage? This is a specific Vashikaran Yantra experiment, which has to be performed as detailed in the article.